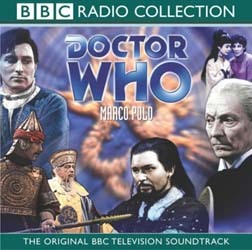 Marco Polo defies the old generalisations that the historical Doctor Who stories are boring. Despite being seven episodes long, writer John Lucarotti's constant changes of location - from the frosty Himalayas and the creepy Cave of Five Hundred Eyes to the luxurious residence of the elderly and eccentric Kublai Kahn (Martin Miller) - keep the audience interested. Of course we don't get to see these wonders, this being the earliest Who serial to be absent from the BBC archives, but we can still hear the unnerving sounds of the "singing sands", the sandstorms of the Gobi Desert. Directors Waris Hussein and John Crockett (who helms the fourth episode) coax excellent performances out of their cast, including Mark Eden as Marco Polo, Zienia Merton as Ping-Cho, the young Chinese girl who befriends Susan (Carole Ann Ford), and the aforementioned Martin Miller. Derren Nesbitt is also good as the villainous Mongol Tegana, though it has to be said that he doesn't sound particularly Asian. Doctor Who was originally intended to have an educational quality in addition to its entertainment value, and this is evident in Marco Polo. Quite apart from the historical information that is provided (though some of it isn't 100 per cent accurate, as the sleeve notes explain) we learn why water boils at lower temperatures at high altitudes, what causes condensation and where the word "assassin" came from. One of this serial's gimmicks was the device of an on-screen map, which showed the progress of Polo's party through Asia as he documented his travels in his journal (and via a voice-over). To compensate for the lack of visuals, the CD pack contains a stylised map, which shows the locations visited during the course of the story. This map is also available as a desktop image on disc 1. The first disc also contains MP3 files of all seven episodes without William (Ian Chesterton) Russell's linking narration. Episode five is rather poor quality in places, owing to the age of the recordings, but we're lucky to have anything to listen to at all. This, the first of the historical Whos, is a classic in every sense of the word.